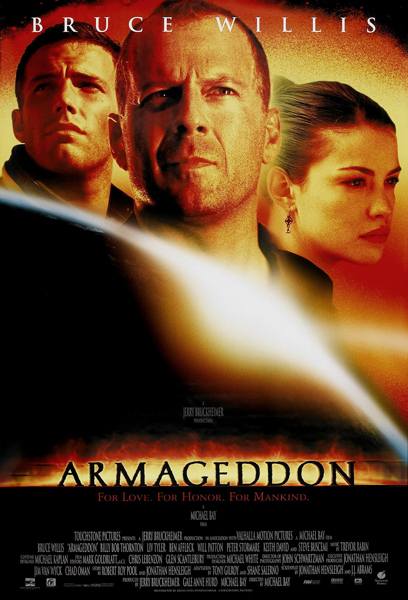 As I recall, Armageddon and Deep Impact both came out at about the same time and both concerned averting an asteroid collision with Earth. Likely neither one of them takes precedence over the other, but in my mind, this one is the original and Deep Impact is the imitator. I only just now learned this film is directed by Michael Bay. I knew he had Hollywood films before Transformers, but I didn’t think it was anything I’d heard of. It only reaffirms my expectations though, since I was already expecting great spectacle without much depth. However, I worry it might drag somewhat, since it’s an hour longer than most movies of the caliber I’m expecting. Unless there are flighty songs or weighty angst, movies don’t tend to have more than 90-100 minutes of content. World space agencies are caught off-guard by a meteor shower that destroys the space shuttle and another that destroys New York City (and presumably other less important places). Soon NASA determines that these meteors are part of a cloud of debris from an asteroid the size of Texas headed straight for the Earth. With only 18 days to save the world from a total destruction event, NASA’s best plan is to drill a hole in the asteroid to put a nuclear bomb inside and split it to pass harmlessly around the Earth. Seeking out the best oil driller in the world, they ask Harry Stamper to train their astronauts. However, Stamper doesn’t trust anyone but himself and his best drilling crew to do it, and insists that NASA take his team of cowboys, felons, and the guy he just tried to shoot in the foot for getting too close to his daughter for the job. About the most plausible thing about the movie is that a planet-killing asteroid could sneak up on us. Just last year we suddenly realized a big rock was only a few months away from passing uncomfortably close. Also, while it did get better as it went on, this felt less like an asteroid coming to destroy planet Earth and more like an asteroid about to destroy planet America. They give some lip service to involving other countries’ space agencies, but the most involvement in this plan we see outside NASA is the use of MIR “the Russian space station” as an orbital gas station where they stop to have some explosions and pick up the only cosmonaut on board. I understand in 1998 countries other than the US and Russia didn’t have much presence in space, but one unhinged cosmonaut and talk of using French satellites seems a bit light. I’m sure that every other world leader wants some input on the US President’s decision of whether or not it’s a good time to prematurely blow the warhead. While the first hour is light on spectacle, it’s the part I like best. They spend probably more time than they need to letting us get to know all the crew and watching them train. Of course, it’s easy to pick out who will and won’t survive, because with one exception, the script doesn’t give us a chance to care much about anybody who won’t make it home. It’s a lot of characters to juggle, and even some of the ones important to the plot don’t get enough room to develop. However… it’s not supposed to make sense. It’s not supposed to be deep and life-changing. It’s not supposed to be realistic. It’s specifically for having some fun and feeling good about what humanity and America can do. The emotional beats are formulaic, but they’re explored just enough to get invested. The action was pretty cool, but by the end it was exhausting. There were too many reversals and I just wanted it to be over already. It’s difficult to raise the stakes in a satisfying way when starting with “everyone on Earth is going to be wiped out by an asteroid”. There are many different aspects of that premise to explore, and while there were sides I wanted that weren’t addressed, the script seemed a bit indecisive about which ones it wanted to focus on. The title implies that it’s more about the panic on Earth than it is. Government interests conflict with what the experts know needs to be done, but only the American government, and only as it directly affects the mission. It could be a better source of tension to have governments squabbling over how to handle the problem while keeping riots in check than to just have a bunch of malfunctions setting off fireworks every ten minutes. Maybe Deep Impact addresses these better. If I recall correctly, Morgan Freeman plays the president, implying that the president might have more to do than order a button be pressed. Watch this movie: with friends, drinks, and an open mind. Don’t watch this movie: with a physics textbook and a group of film snobs.